The Running Back position contained many known commodities entering the 2017 season, and those players delivered – Rashaad Penny, Saquon Barkley, Myles Gaskin, etc. In 2018, it will be completely different with new names that will dominate the top running backs in the college fantasy football rankings. 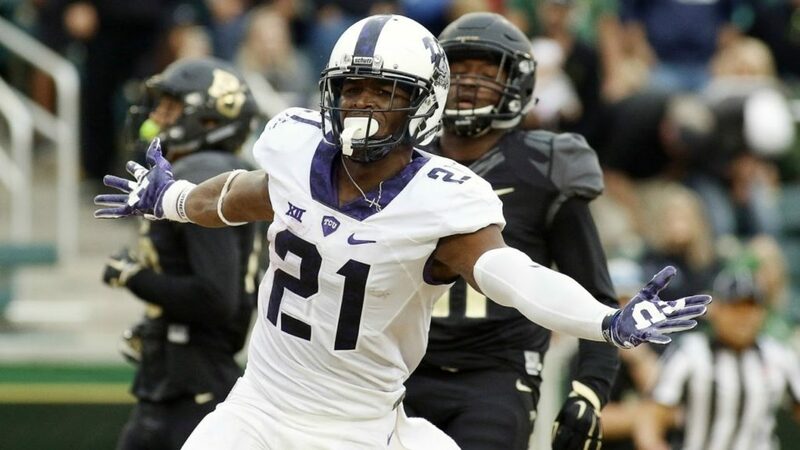 TCU running back Kyle Hicks was entering his senior season coming off a tremendous junior campaign in which he rushed for 1,000 yards and scored 14 touch downs. Hicks was a running back you could start every week and expect double digit fantasy points with no concern His senior season saw him take a different road. Hicks had an injury plagued season and saw him only find the endzone 4 times and rushed for only 637 yards. Arkansas lost a huge asset to their backfield when Rawleigh Williams announced he would be retiring from football but thought they had the guy to replace him in Sophomore Devwah Whaley. Arkansas always produces fantasy running backs so Whaley was poised to make some noise last season. Unfortunately that never came to pass and those who drafted him to be one of there top 3 running backs came away disappointed. Whaley finished is sophomore season with only 559 yards and 7 touchdowns. After an exciting Freshman season, Weber opened his sophomore season on the injured list and lost a lot of his touches to an incoming freshman. Weber was able to find the endzone 10 times but only managed 626 yards on the ground which is far below is freshman campaign which saw him break the 1,000 yard mark. Rodney Smith for Minnesota was a touchdown machine 2 years ago rushing for 16 touchdowns. Those kinds of numbers warrants people to move you up their draft boards the next season. However, for those people who took a risk on him ended up coming up short. While Smith did carry the ball for 977 yards, he saw a drastic decline in his touchdowns from 16 to just 3. Armstead like other running backs on this list was a touchdown machine 2 years ago accounting for 14 touchdowns and 919 yards. Many expected an increased workload and the same, if not better stats last year. Amstead was not able to have a repeat performance and ended the season with just 604 yards and 5 touchdowns. The Stanford Cardinal running back had some monster shoes to fill when Christian McCaffrey headed to the NFL. After serving as Mcaffrey’s backup the previous season many people could see the talent that the sophomore possessed, but was not sure how he would end up handling the workload. Well, after a few games it was apparent that not only could he handle the workload, but he was gonna be in the Heisman Trophy talks all season long. Love ended his first season tallying 1,938 rushing yards and 18 touchdowns. Johnson took a backseat two years ago to Pettway as the season progressed and many fantasy owners could not count on or even think about putting hi in their starting line up. Coming into this past season Johnson was way down the recruiting rankings for top backs and was thought to possibly be a hand cuff to the person that owned Pettway. Well, Pettway had an injury riddled season and Johnson took the reigns back and finished the season with 1,391 yards and a whopping 18 touchdowns. Well, another season is over and we are talking about another Wisconsin running back putting up some ridiculous numbers. Last year it was all about Freshman Johnathan Taylor. Taylor finished his Freshman campaign with 13 touchdowns and 1,977 yards on the ground.